Welcome! 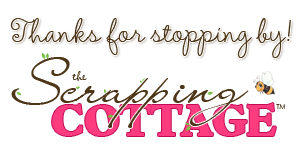 This is Beverly Polen from Guneaux Designs and I am a guest designer today for the Scrapping Cottage. 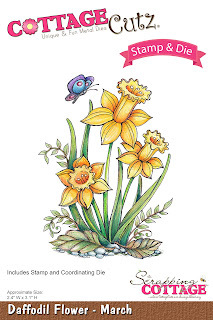 I have for you a project featuring the CottageCutz Daffodil Flower - March stamp and coordinating die set. Speaking of March, did you know that the month of March is synonymous with the onset of spring in the Northern Hemisphere? Accordingly, the flower associated with the month of March is the Daffodil. 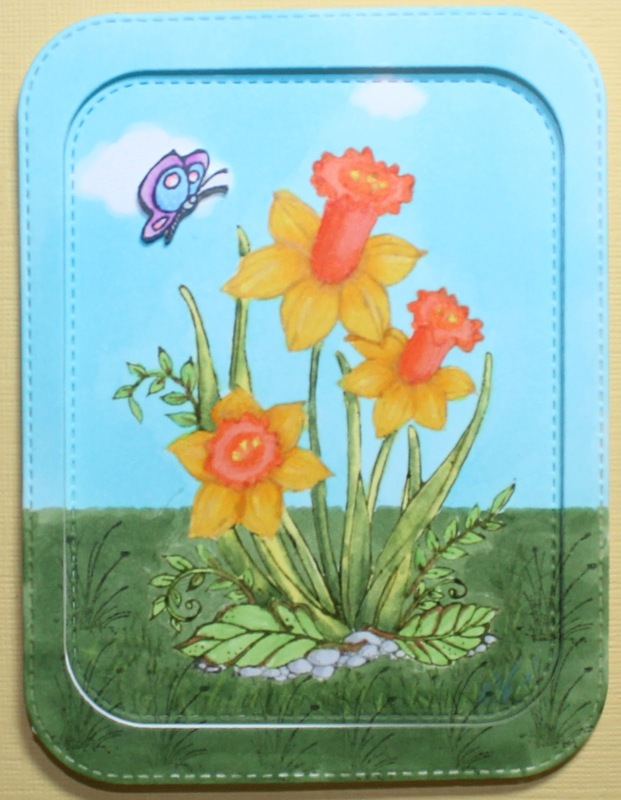 There is a flower for each month of the year, and Scrapping Cottage has a stamp and coordinating die for the flower of each month. 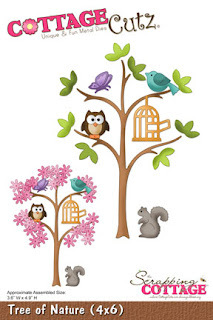 Check out these beautiful stamps and dies here. 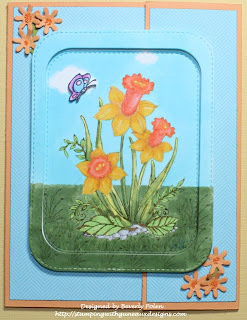 Moving on, here is the card I made with the beautiful CottageCutz Daffodil Flower stamp. 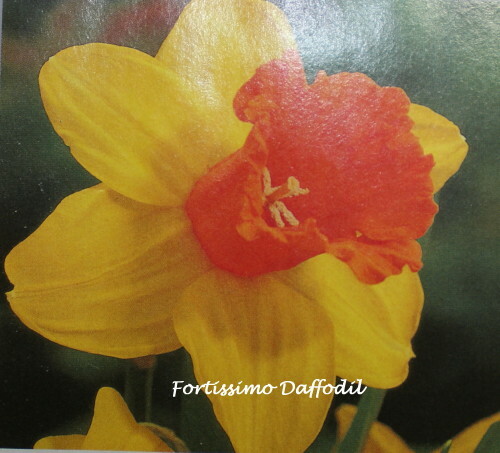 My Daffodil is designed after the Fortissimo Daffodil that has yellow petals and a cup of glowing orange to red. Here is a picture of the flower. Step 1. 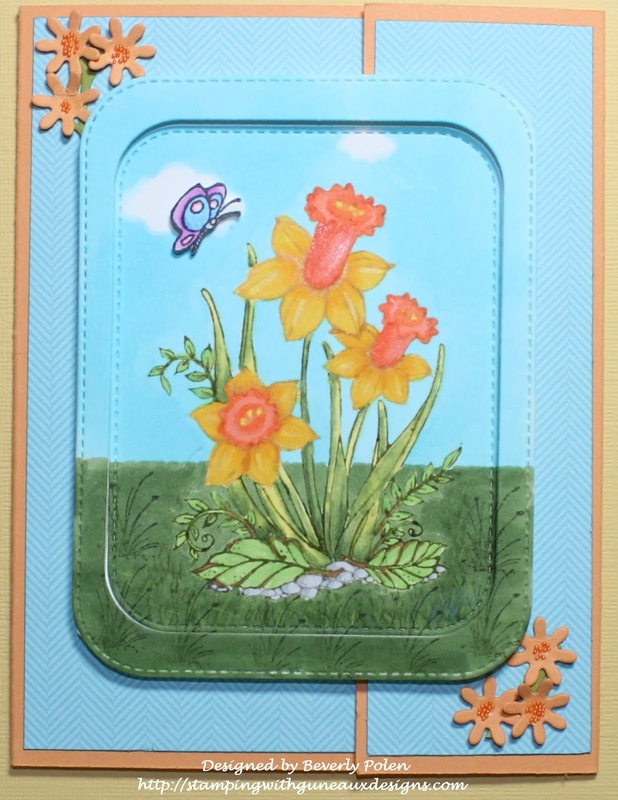 Stamp the CottageCutz Daffodil Flower onto a piece of white card stock. I wanted a "no-line coloring" image; therefore, I used different colors of markers to add ink to different sections of the image and stamped them separately. 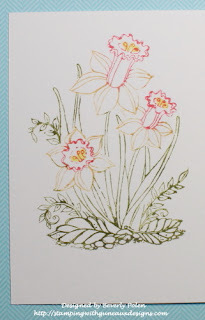 I used yellow for the petals of the Daffodil, peach for its cup, green for its leaves and stems, and gray for the rocks. Step 2. Color the image as desired. I used various Copic Sketch Markers to color my image. After coloring the image, I used the two largest dies from the CottageCutz Stitched Rounded Rectangle Set to cut out the image. 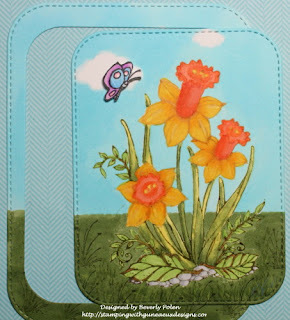 Also, I stamped, colored, fussy cut, and attached the butterfly that is part of the CuttageCutz Daffodil Flower - March set to the image using double-sided foam tape. Step 3. 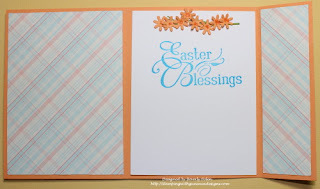 Set aside the image and start creating the card base. Step 4. Cut a 5-1/2" x 10" piece of card stock. Step 5. 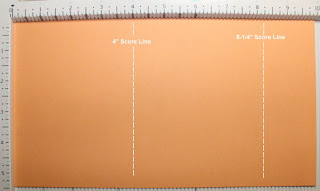 Place the card stock horizontally onto a score board and score at the 4" and 8-1/4" marks. Step 6. 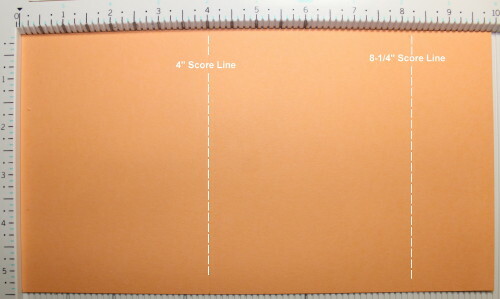 Fold the score lines toward each other. Step 7. 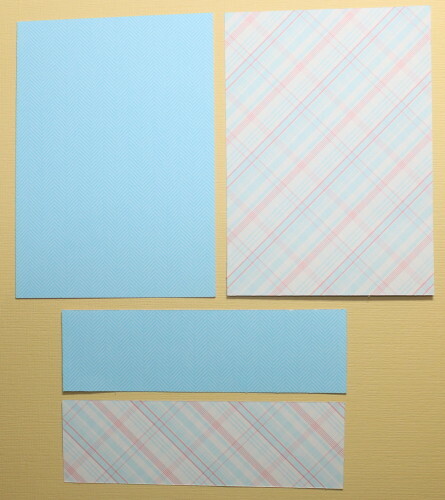 Select a double-sided designer paper and cut two 3-3/4" x 5-1/4" pieces, and two 1-1/2" x 5-1/4" pieces. Step 8. 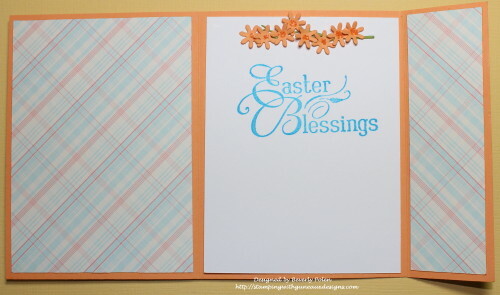 Attach one of the 3-3/4" x 5-1/4" pieces of designer paper to the larger flap on the front of the card base. Step 10. 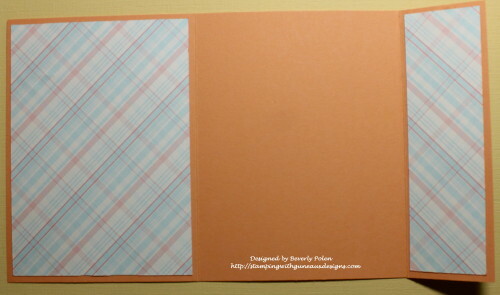 Attach the second 3-3/4" x 5-1/4" piece of designer paper onto the inside large flap. I used the other side of the designer paper. Step 11. Attach the second 1-1/2" x 5-1/4" piece of designer paper onto the inside small flap. Step 12. 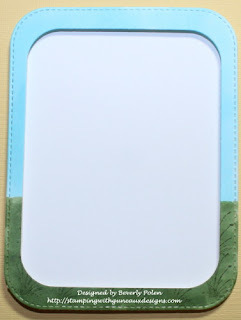 Cut a piece of white card stock using the largest die from the CottageCutz Stitched Rounded Rectangle Set. Step 13. Attach the outside frame cut from the image (see Step 2.) 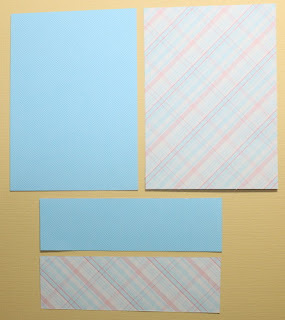 to the piece of white card stock using a double layer of double-sided foam tape. Step 14. Attach the image inside of the above frame. Step 15. 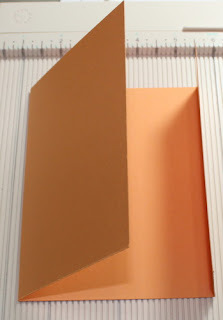 Apply a strong adhesive to the back left side of the above image piece. Step 16. 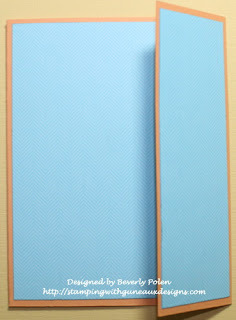 Close both flaps of the card base with the right one over the left one. Attach the framed image to the front large flap of the card base, ensuring it is centered over the front and not attached to the right small flap of the card. The strong adhesive is necessary to ensure the image piece will not come off as the card is opened and closed. Step 17. Cut a 4" x 5-1/4" piece of white card stock, add a sentiment and/or an embellishment, and attach to the center of the inside of the card. 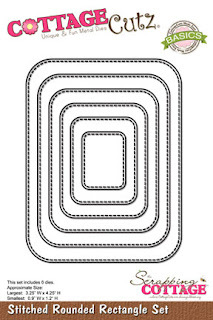 Step 18. Embellish the card as desired. 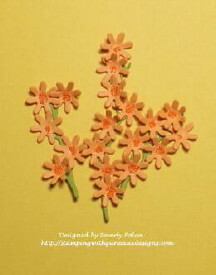 I cut several small flowers using the CottageCutz Tree of Nature Die. I cupped them with a stylus and adhered micro beads to the centers. 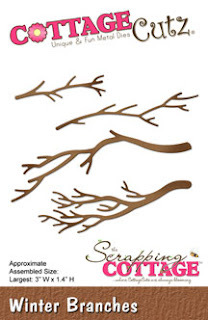 I used the CottageCutz Winter Branches Die to cut green stems (not branches - LOL) for the tiny flowers and added them to the two corners of my card front and the center piece inside of the card. I hope you are inspired by my CottageCutz Daffodil Flower card. 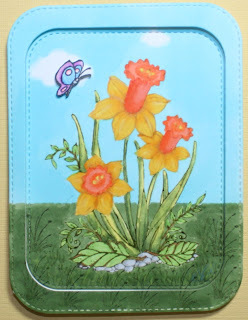 Come back tomorrow to see another project that is created with CottageCutz Dies! Gorgeous daffodils! Love your design too! 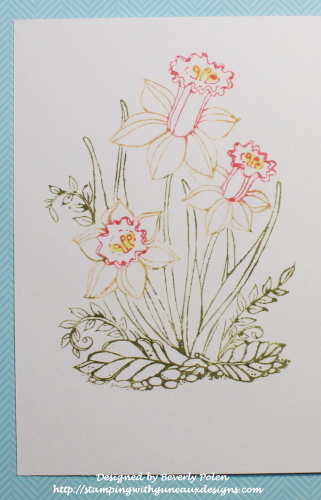 What a pretty card using one of the most iconic flowers of spring! Your flowers mimic the real thing in your photo very well. You do a wonderful job explaining and showing exactly how to constuct the card base too. Looking forward to future posts! Great card -- I love the way it folds. And you did a good job of recreating your daffodil!